Hattie Winston is Dr. Becker's no-nonsense, dryly ironic nurse, Margaret, in Becker. 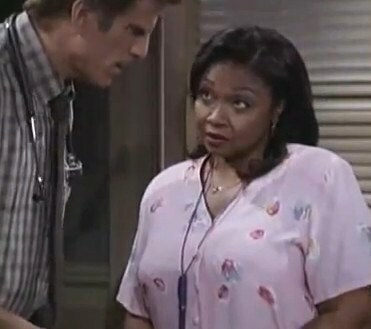 Her character is absolutely necessary to the sitcom since without a Hattie Winston, a Dr. Becker becomes simply Yelling Man (or, as one episode is titled, "Angry Head"). Margaret calls Becker on his crap, perceives his "heart of gold," and delivers to-the-point insights. Okay, yes, she is something of a trope. Hattie Winston makes her real, likable, and hilarious. Linda: They're more fluffy, like a croissant. Becker: Mm, I think they're much fluffier than that. Margaret: When was a little girl, I had a dog named Fluffy. Becker: What does that have to do with anything? Margaret: I had him neutered because he kept interrupting me. It's not just the line, of course, but the way she says it--with punch and an evil eye. Hattie Winston has a long career, starting with The Electric Company (remember that show?!). One of my favorite Hattie Winston guest star appearances is in Castle's "Kill the Messenger." She plays the sickly aunt with tons of cats, who serves Castle et al. tea while they fix her door.